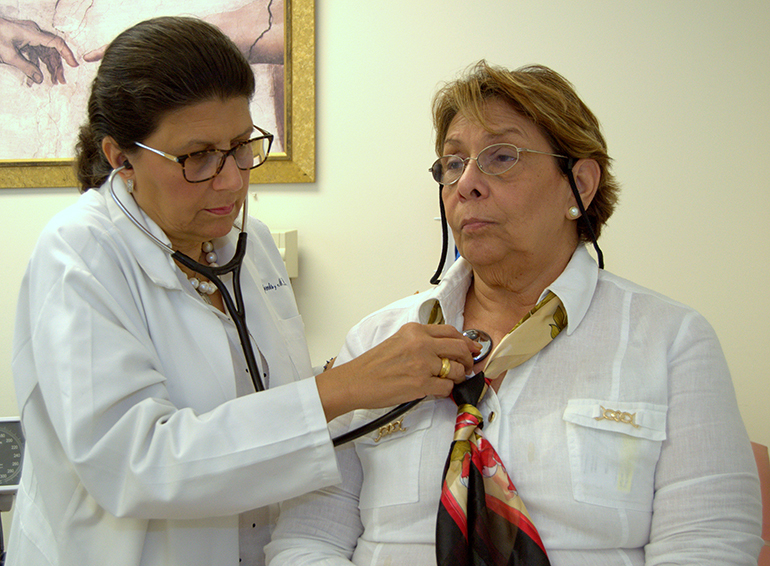 Dr. Lourdes Sanjenis examines her patient Rosa Zambrano at St. John Bosco Clinic. MIAMI | Rosa Zambrano suffers from several chronic ailments, including hypertension, tendonitis and impaired glucose tolerance. Thank God she also has St. John Bosco Clinic. Yes, she says it that way. "I give thanks to God that I fell into the hands of this clinic," Zambrano said. "I give thanks to God that my health has improved." Multiply her case by tens of thousands, and you get an idea of the reach that the clinic has developed over its 25 years. Sponsored by the Sisters of St. Joseph of St. Augustine, the clinic provides free screening, treatment, medicines and specialist referrals for free — all for people who otherwise couldn't afford it. 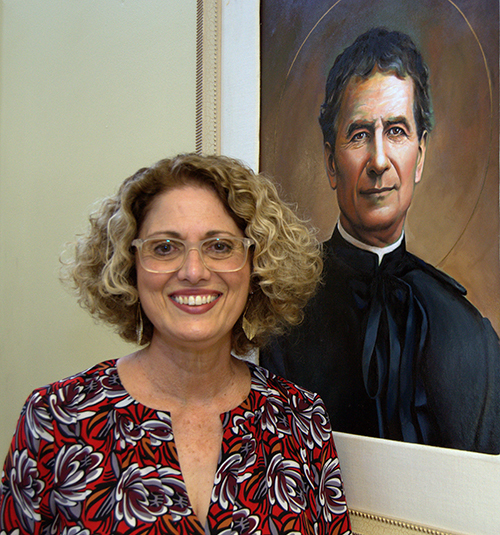 Berta Cabrera, executive director of St. John Bosco Clinic, shows a painting of the 19th century Italian saint. 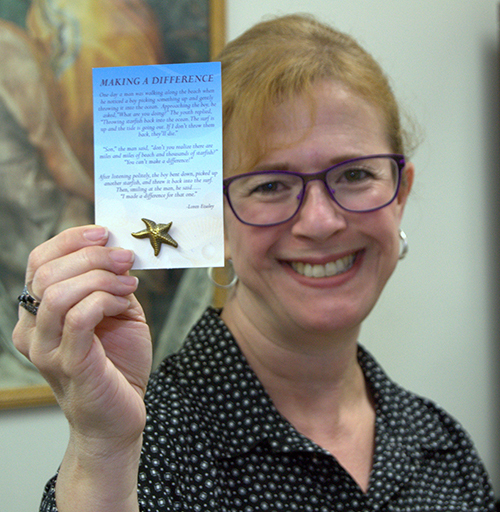 Luz Gallardo, supervisor at St. John Bosco Clinic, shows a starfish pin given out to all the clinic volunteers. The starfish parable illustrates how one person may not solve a problem but can still make a difference. Ady Viera, standing, with fellow volunteer Teresita Michelena at St. John Bosco Clinic. As the clinic looks toward its silver anniversary, its staff and volunteers are seeing a rapid ramp-up of patients. But Berta Cabrera, its executive director, sounds as upbeat as Zambrano. "Yes, there is a lot of need, but thank God we have this clinic to help some of them," Cabrera says. "There is not a day when I don’t go home and feel I was able to do something for someone." St. John Bosco Clinic will celebrate its silver anniversary with a gala Sept. 9 at the JW Marriott Marquis in Miami. The cocktail, dinner and program will honor those who have supported and worked with the clinic over the quarter-century. Giving the invocation and presentation will be Archbishop Thomas Wenski. The clinic acts as family doctor for preventive treatment, diagnostics, chronic disease management, and referral to specialists and community agencies. If someone has a more serious condition, Bosco can send them to places like Jackson Memorial Hospital. And if they can't afford medicine, the clinic can often get a reduced rate or even free doses. All of this work runs on an annual budget of $550,000, including $300,000 from the Florida Department of Health. The rest comes from individuals, corporations and local foundations. Other help comes from specialists — in psychology, cardiology, rheumatology and other fields — via students and doctors at UM. The clinic gets more help from pharmacy students from Nova Southeastern University, and it recently signed an agreement for nursing students with Miami-Dade College. Also helping are doctors with the Sovereign Order of Malta, Cuban Association. Early screening often makes a big difference. Cabrera recalls two young diabetic women who could no longer control their blood sugar with injections. Dipping into an anonymous fund, the clinic gave them insulin pumps. "They improved so much, they're no longer our patients," Cabrera said. "They go to worship and school." The clinic takes its name from St. John Bosco Church in Little Havana, where it opened in July 1992. The Bosco clinic was originally part of Mercy Hospital, run by the Sisters of St. Joseph, but went on its own after the hospital was sold. At first, the clinic worked out of 800 cramped square feet of converted classroom space. Then Father Jose Luis Menendez, pastor of Corpus Christi offered his church's social service building on 34th Street, north of the church. The roomy, 2,838-square-foot building has four examination rooms, plus separate offices and waiting room. St. John Bosco Clinic still gets most of its patients from Little Havana, although nowadays they also come from as far south as Homestead, as far north as North Miami. But they must be from Miami-Dade County. Their income must be no more than twice the federal poverty level based on family size. And they must have no medical insurance. For volunteers like Dr. Lourdes Sanjenis, a 10-year-veteran at the clinic, St. John Bosco has another benefit: "You can practice medicine as you should. There's no third person or insurance company looking over your shoulder." For her, that includes building relationships with patients like Rosa Zambrano — even sharing photos of her grandson. "Just today, instead of starting with her condition, she said, 'How's the baby?'" the internist said with a smile. Teresita Michelena sees her 13-plus years of volunteer work at Bosco Clinic as a product of her upbringing. "I was taught since I was small that you should give back," said Michelena, who works in patient assistance programs. "That's what I'm doing here. I'm helping the community. I love it." And St. John Bosco Clinic will need more people like that: Just in the fiscal year ending June 30, volume has risen 20 percent from the previous year. That amounts to 428 new patients who made 4,649 visits to the clinic and 516 visits to specialists. Hence another campaign by the clinic, for more volunteers. "We've had an increase every year, and we don't know why," Cabrera said. "But it shows how huge the need is. And that there are still many, many individuals who lack access" to health care. Address: 730 N.W. 34 St., Miami. Hours: 8:30 a.m. to 4:30 p.m. Monday through Friday. By appointment only. Founded: July 1, 1992, by Mercy Hospital under sponsorship of the Sisters of St. Joseph of St. Augustine, along with St. John Bosco Church. Mission: Medical care — including examinations, diagnoses, medicines, specialist referrals — for Miami-Dade residents who can't afford it and don’t have insurance. Workers: 28 doctors, 19 other licensed healthcare providers including nurses, dentists and specialists in acupuncture, chiropractic and medical massage; also 20 support volunteers who answer phones, register new patients and refer them to specialists. Budget: $550,000, from grants and individual and corporate gifts, plus in-kind assistance. Patients served: More than 35,000 over its 25 years, including 1,416 last fiscal year, totaling more than 100,000 visits. To volunteer for St. John Bosco Clinic, e-mail sandra.preval@sjbclinic.org. For tickets to the Sept. 9 gala, contact Berta Cabrera at berta.cabrera@ssjhealthfoundation.org or 305-854-0533.